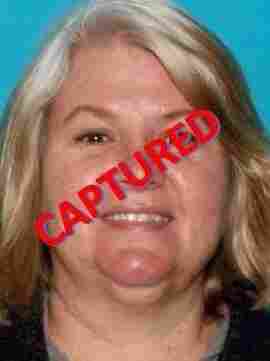 Lois Riess, 'Fugitive Grandmother' Wanted In 2 Killings, Is Arrested In Texas : The Two-Way "We look at her appearance. She looks like anybody's mother or grandmother," said Undersheriff Carmine Marceno of Lee County, Fla.
After weeks of living as a fugitive — and reportedly trying to steal the identity of a look-alike — Lois Riess has been arrested. Riess, 56, is wanted in connection with killings in two states, as well as stolen and forged checks. "We look at her appearance. She looks like anybody's mother or grandmother," Undersheriff Carmine Marceno of Lee County, Fla., said Friday. "Yet she's an absolute cold-blooded murderer." Calling Riess a "fugitive grandmother," the U.S. Marshals Service says its agents arrested her at a restaurant in South Padre Island, Texas, on Thursday night. The agency had posted a $5,000 reward for help in apprehending Riess, who is accused of shooting and killing her husband, David Riess, in Minnesota, last month, before traveling to Florida and killing Pamela Hutchinson, 59. "Authorities weren't aware of any connection between Lois Riess and Hutchinson — other than that the two looked alike," member station Minnesota Public Radio reports. "Police believe Riess fatally shot Hutchinson in Fort Myers Beach, Fla., earlier this month to assume her identity while Riess tried to evade arrest." The Marshals Service also called her "losing streak Lois" — a reference to Riess' affinity for gambling. Riess is now in a Texas jail, awaiting extradition. It's not certain where she could face trial first. She currently faces a murder charge in Florida and a felony theft charge in Minnesota, where an additional murder charge is being prepared, officials say. Investigators at the Dodge County Sheriff's Office in Minnesota say that on March 23, Riess went to a bank in Glenville, Minn., and cashed more than $10,000 in stolen and forged checks from her husband and his business. She then drove to the Diamond Jo Casino in Northwood, Iowa — where she spent most of the day gambling. She was later seen on a gas station's surveillance camera buying a sandwich and asking for directions south, out of the state. On April 5, Riess turned up at the Smokin' Oyster Brewery in Fort Myers Beach, Fla., where she was spotted on a surveillance video chatting with Hutchinson. Later that same day or the next, police say, Riess killed Hutchinson inside a Fort Myers Beach condo, stole her driver's license and credit cards, and drove away in Hutchinson's 2005 white Acura TL. Investigators say Riess used Hutchinson's credentials to withdraw $5,000 before heading north to Ocala, Fla., where they say she paid for a hotel room with Hutchinson's credit card. Soon afterward, she headed west: Sightings were reported in Louisiana and in Corpus Christi, Texas. Police urged members of the public to report any sightings of the fugitive but warned that she "should be considered armed and dangerous and should not be approached. Anyone who sees her should call 911." That's what happened last night in South Padre, the resort island where a restaurant worker called the authorities. When deputy U.S. marshals and the South Padre Island police arrived, they located the Acura with Florida tags that Riess had been driving. When they went inside a nearby restaurant, they found Riess sitting at the bar. On Friday, U.S. Marshal William Berger of the Middle District of Florida credited the "doggedness" of agents in Minnesota, Florida and Texas, along with other state and local forces, for making the arrest. Berger added, "I also want to thank the media and the public. You played a significant part in helping us capture Riess and ending her dangerous crime spree." When Dodge County Sheriff Scott Rose was asked Friday what might have triggered the alleged crime spree, he said, "I have no idea. We don't know, sorry." Rose said that in recent weeks, both Riess' and Hutchinson's names had been flagged for the U.S. Border Patrol, in case she attempted to cross into Mexico. Asked about Riess' continuing to drive the same white Acura and appearing on surveillance cameras after leaving Florida, Rose said, "I'm guessing she was just waiting to be caught."